by Allison McDonald Kids love to sort and sorting is a stepping stone to recognizing and making patterns. 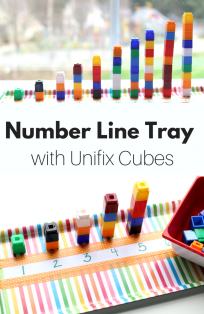 Using toys and playful activities to work on math skills is the only way I do it with preschoolers. My son loved doing more structured work so I offered it to him, but my daughter is much more into using manipulatives and toys for learning. 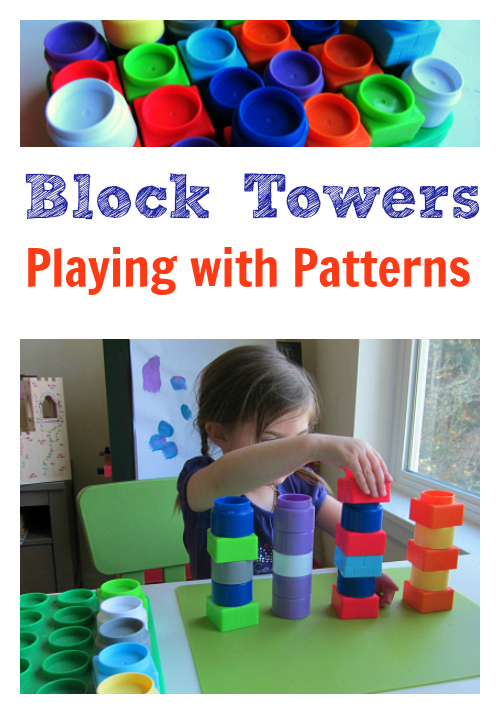 These block tower patterns let your kids explore patterns and even if they don’t complete the pattern they are still building a tower. 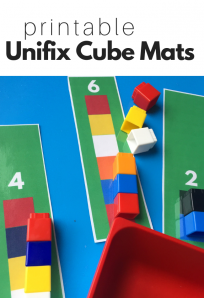 Depending on your child and your goals for them you can choose to correct them or simply have fun building towers knowing that they might not be ready for this challenge yet. Gather your materials. All you will need are some blocks that stay together. Duplo or Little People Builders are my favorite for this age group but if you are doing this with older children regular Lego is awesome. 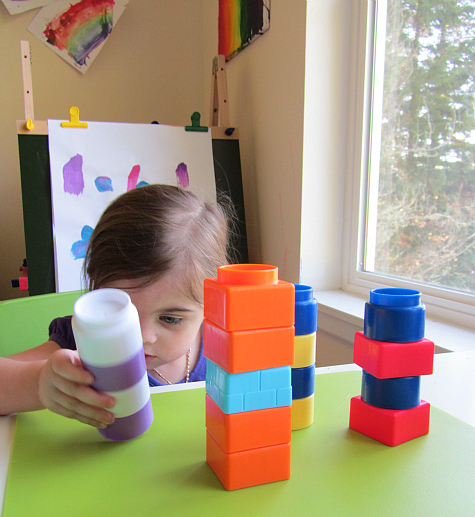 I like blocks that interlock because the goal is to pattern and/or build and if your child is spending all their time rebuilding towers that fall apart they could get frustrated and in our house frustration often leads to the end of an activity. 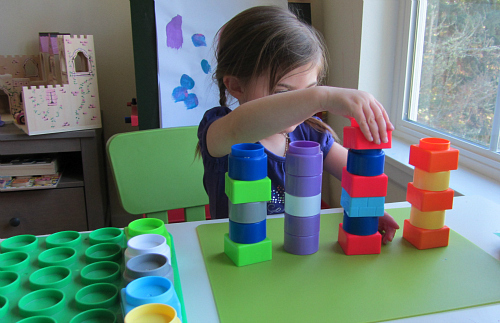 Make some simple pattern towers with the blocks. Set the blocks needed to complete the patterns to the side. 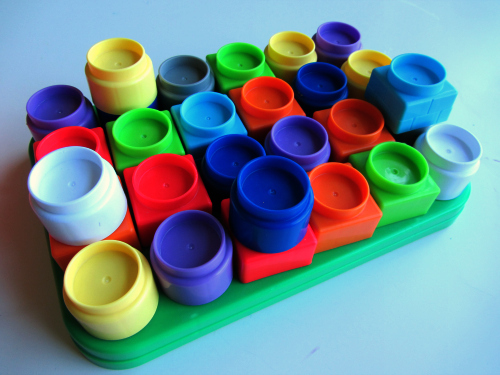 Depending on your child’s ability you can put only the blocks needed here to work as prompts or have lots of options to make it more of a challenge. She was on these towers like a house on fire. Once I saw that she was getting it I would question her if she put a block that wasn’t in the pattern on. Saying something like ” Let’s sing this pattern. Blue red white blue red … what ‘s next? 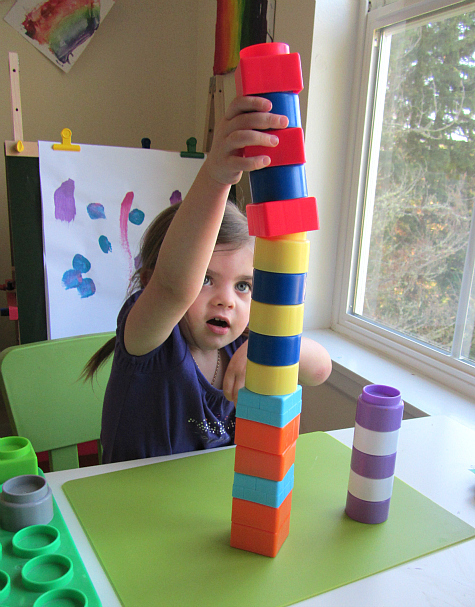 ” of ” Do you see that color in the tower?” It’s a fine line of keeping it playful but giving your child a challenge they can do. I don’t always say the right things. 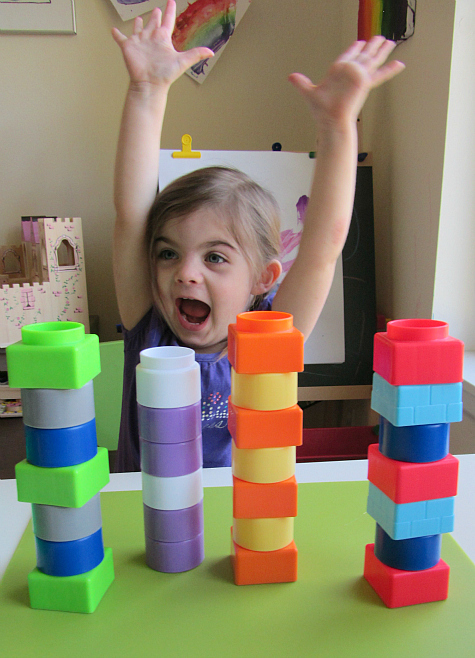 After she completed each tower she built a huge one and knocked it over in celebration. Then we did it all again! That’s the best part of this you can do it over and over again. Each time we celebrated! Keeping learning playful is a huge goal of mine and even though you see the more structured side of this on the blog these activities make up only a very tiny part of our day and some days not even that much. 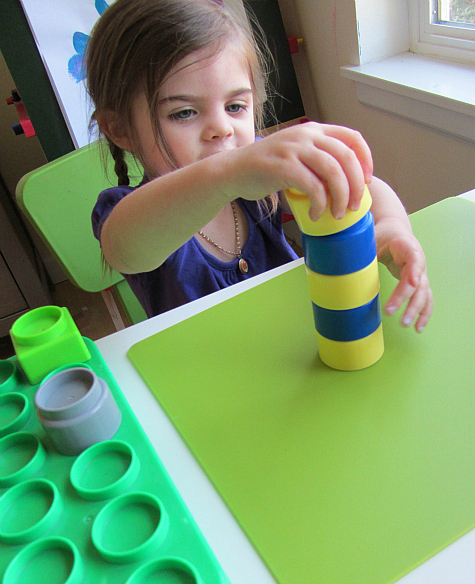 Noticing patterns during every day play is a great way to introduce them to your child. Observations don’t have to spin into drawn out lessons just observe, talk and keep playing. 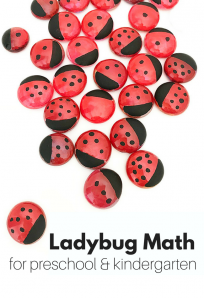 For more fun math ideas for your preschooler check out our Math is Fun board on Pinterest.